Wander through a busy supermarket in Kyoto with your host who will explain the local products such as fresh fruits and vegetables and Japanese spices. Following that, head to a tofu shop for a cooking lesson. During the hands-on class, learn how tofu is made from soybeans and the variety of items that can be made from it. 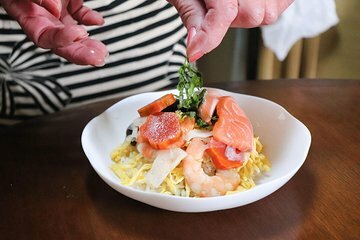 The freshly prepared meal may include dishes such as chirashi sushi (a popular way to serve sushi at home), miso soup, teriyaki of fatty buri (yellowtail) fish, and tofu dishes.